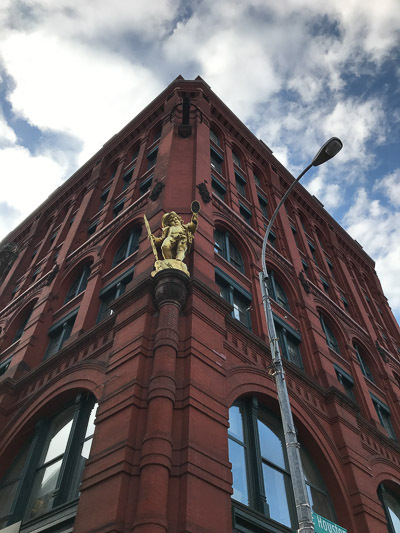 The Puck building once housed the largest lithographic printing press operation under one roof in the world. This gorgeous 1887 Romanesque revival building is located in Nolita, New York City, and was home to Puck magazine between 1871 and 1918. Puck was the first political satire magazine in the United States, and the first weekly to use color lithography. The building primarily housed printing related industries throughout most of the twentieth century, though in the 1980’s, another satirical magazine, Spy, had its headquarters there. Kurt Anderson, the co-founder of Spy, also has the distinction of being the first person to call attention to Donald Trump’s bizarrely small hands. Anderson also named him one of the 10 most embarrassing New Yorkers in 1986. Ironically, Ivanka Trump and Jared Kushner have a condo in this very building, ostensibly to store their contemporary art collection, and Kushner Enterprises now owns the building. 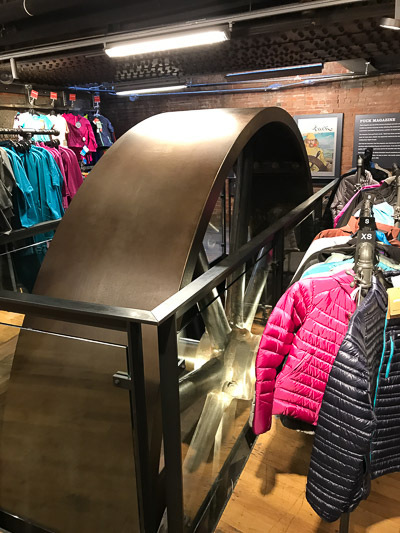 Anyway, the first couple of floors are occupied by REI’s flagship store for outdoor performance sportswear. Even if you aren’t in the mood to shop for 300 different types of wool hiking socks, there is a fairly large collection of lithographic stones on display. These were discovered when the building was renovated in 2011. Lithographic stones on display. I bet some of you would love to dig your knife into these babies! Some are very damaged, but I’m glad to see them preserved and displayed. Some appear to have been in wet soil for quite some time. A small plaque mentions they presumably came from the J. Ottmann Lithographing Company, which began in the 1880’s. About 20% of the stones in this display are right-reading, like this one. The display includes a number of right-reading stones. Terry Bellinger calls these “mother stones” and describes a stone to stone transfer. The often used mother stone was printed onto a daughter stone (creating a reversed image), then the daughter stone was used for the printing onto paper, generating a right-reading image once again. The mother stones could also be ganged together onto a larger daughter stone. 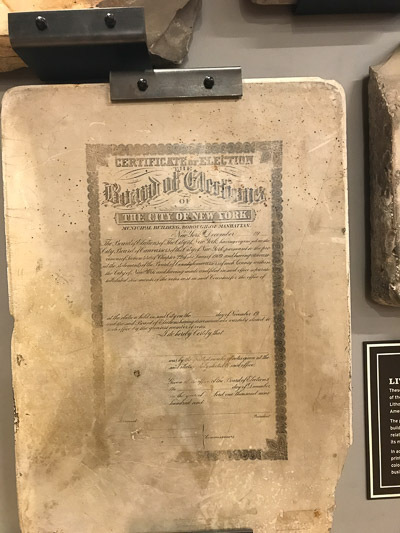 For example, four of these Board of Education certificates in the image above could be printed onto a large daughter stone, then all four images printed at the same time onto a sheet of paper. In addition to speed, he mentions this technique protected the mother stone from damage. 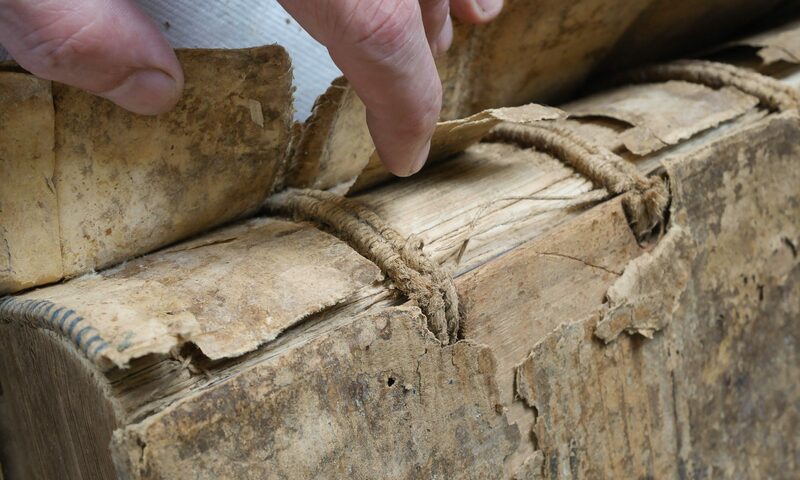 A recent thread on the Book-Arts_L Listserv, “Question about stone lithography and printing” raised some questions about stone to stone transfer, since it would be quite difficult to register the stone upside down, it would be prone to cracking, and difficult to lift off. Ludwig Mohr describes a method of first transferring the image from a right reading stone onto an Albumen saturated piece of paper, then is then used to print from, presumably pasted to a stone? If a wrong-reading image was printed onto a carrier, then it would transfer back to a right-reading final print. Of course, different printers may have used different techniques to print from a right-reading stone, but given the prevalence of these stones it bears more investigation. I didn’t notice anything written about it in the 1904 Handbook of Lithography. Further info is appreciated. Also in the store there are also two massive cast iron flywheels from the original power plant. They form an odd contrast to the featherweight plastic performance hiking gear. But who doesn’t like monster cast iron flywheels? Or featherweight plastic performance hiking gear? 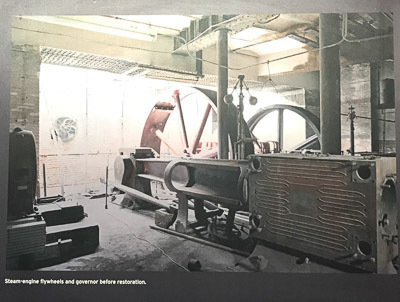 An undated photo of the original configuration of the flywheels. Lithographed cartoons and illustrations formed a large part of Puck magazine’s content. 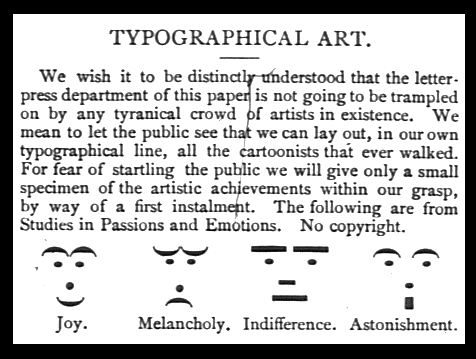 So much so, that the letterpress department felt it humorous to issue the following notice in 1881, in an attempt to elevate their emoticons to the level of visual art that existed elsewhere in the magazine. Thanks Evan. I will check out the building next time I’m around 34 th St.
My presumption would be that right-reading stones were used for offset lithography. Around 1905 it was discovered that if the ink was taken off the stone onto a rubber blanket, and then the paper was printed from the rubber blanket, the image would be sharper and more brilliant. Printing from the stone continued for many decades after this, not direct but combined with offset. Although the use of a zinc plate to replace the stone had been developed in the late 19th century, it would seem that printers preferred stone to zinc, I con’t know why. I didn’t know about mother stones, but the concept would be an easy extension from 19th-century practices with stereotyping books. I’d be interested in contemporary sources with more information. San Francisco was a great center of industrial color lithography in the 19th and far into the 20th century. Labels for fruit crates, now collected as works of art, and for food cans, were all multi-colored, were reprinted frequently and in huge numbers without change over a period of decades. Some of my litho stones have had all the colors for the same can on one surface, and this is more common than not. 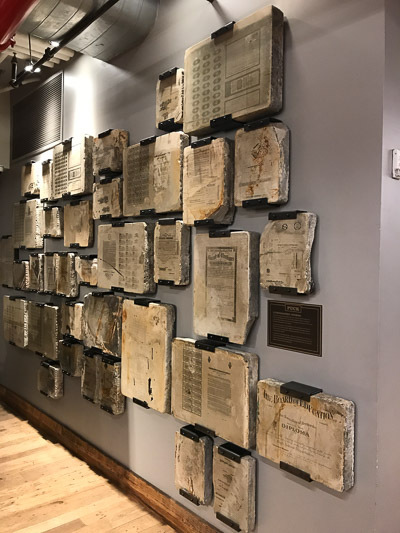 When litho firms converted to aluminum plates they usually left many tons of their now-useless stones where they were stored in the basement, since the cost of moving them was more than the value of the space. As late as the 1970s local binding teachers would occasionally get a call when an old-established litho firm was moving to the suburbs or going out of business, offering thousands of pounds of stones for the trouble of moving them away—if it could be done the next day. Some of my stones came from a hoard like this, gathered in by my teachers less than a decade before I started lessons. By 1981, though, when I started, such opportunities were gone forever. Bay Area binders who began in the 1990s got their stones from a supply imported from Limoges in France, where they had been used for printing transfers for printing the decorations on fine porcelain dinnerware. Thanks Tom. Offset does make more sense, and the little bit of searching on the web didn’t turn up anything but Terry Bellingers comment, that didn’t have any citations. Maybe illustrators continued drawing on the stone for the tactile feedback, like writing on paper rather than a tablet? Previous PostPrevious Small. Really Small. Submicron Sharpening. Polyester Leather. SuperStrop. Next PostNext Boards Bindings, Temporary?